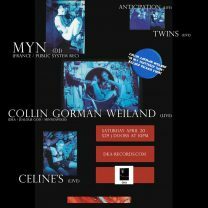 Legendary Midwestern mainstay and master of sub-underground American electronics, Collin Gorman Weiland (CGW), has a new release forthcoming on DKA Records and is coming down to celebrate and grace us with a live set. We're also bringing in Public System Recordings boss Myn in from France to handle the decks. Atlanta's own Celine's and DKA's own Anticipation and TWINS / That Which Is Not Said will also perform.